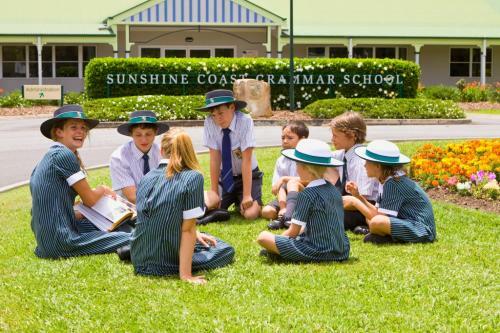 Sunshine Coast Grammar School is a co-educational, Christian independent school catering for the complete education of children from Prep to Year Twelve. The School is situated on 88 acres of natural rainforest at Mons Road, Forest Glen, at the base of Buderim mountains. Sunshine Coast Grammar School affectionately known as “Grammar” has enjoyed substantial growth since its establishment in 1997. Whilst in their tenth year the School’s executive committee recognised the need to develop a comprehensive marketing strategy to solidify the School’s positioning and vision to be school of choice on the Sunshine Coast, offering quality education in a Christian environment. After initial discussions with the School’s Headmaster a branding and positioning workshop was held with the Executive Committee to gain all stakeholders’ input into the School’s ethos and values, points of difference, competitors and plans for the future. It became evident that the School’s strong “academic care” philosophy was highly regarded within the School community and was a distinct point of difference and attraction for the School. During consultation with all stakeholders representing the entire School community immense pride in the School’s house colours was also ascertained. Emphasis was therefore placed on highlighting the House colours and delivering the ‘Strength of Purpose’ positioning throughout all internal and external collateral. The School’s strength of purpose derives from their core values of respect, care, trust, empathy and integrity, which in turn underpin all their actions and aspirations. New business collateral with refreshed colours and the inclusion of Strength of Purpose and a Grammar watermark were developed and rolled out. As well as business livery a commemorative 10th year anniversary yearbook was produced highlighting the Grammar School’s achievements in its 10th year. In addition importance was placed on all communications being fully branded to reinforce the School’s positioning and branding to current families as well as prospective families. To assist the School community in using the new branding correctly a comprehensive style guide was developed. The style guide outlined how to use the logo, colours and watermark, typography, stationery, business forms, publications and signage and was made available in both hard copy and disk. The School’s brand was refreshed to the extent of developing new entranceways at the School’s road entrance, at the beginning of the School grounds and recommendations for a face lift of the School administration block’s entrance including installing the School’s symbolic lions at the front of the entrance. Colour coded signage to highlight the different School areas was also introduction and installed throughout the School’s main driveway. A role for a Marketing Manager, responsible for the day-to-day marketing operations was identified and defined which has now been filled. Marketing Angels continue to provide professional advice and guidance on the School’s strategic marketing plans and mentor the Marketing Manager on a regular basis. This team approach ensures the day-to-day operational tactics are implemented and the School’s positioning as a leading School is enhanced and market share increased. Marketing strategies such as implementing Open Days and regular community events were recommended and implemented. Alliances were reviewed and recommendations made to partner with the Australian Institute of Company Directors to further the School’s relationship with the business community. The School also sponsored the Sunshine Coast Daily’s Newspapers in Education initiative, which again enhances the School’s local community involvement, as well as assisting in providing educational resources to classrooms throughout the North Coast. Negotiations are presently under way with the Sunshine Coast Daily regarding a joint academic scholarship for a promising local student to join the Sunshine Coast Grammar School student community.